The Crown of Charlemagne was a name given to the ancient coronation crown of Kings of the Franks, and later Kings of France after 1237. It was probably originally made as a simple circlet of four curved rectangular jewelled plates for Charles the Bald, the grandson of Charlemagne, but later, four large jewelled fleur-de-lis were added to these four original plates, probably by Philip Augustus around 1180 and surmounted by a cap decorated with precious stones. At this time a similar but open crown, the one of the queen, existed too. One of them was melted down in 1590 by the Catholic League during the siege of Paris. 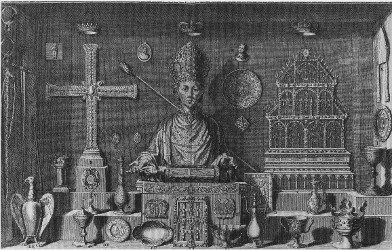 The remaining crown was used up to the reign of King Louis XVI, who was crowned in 1775 in the Cathedral in Reims. The crown of Jeanne d'Évreux was then used for the coronation of the queens. 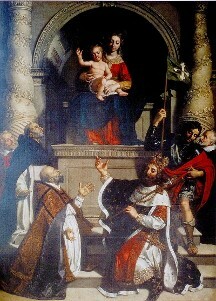 French kings had also their personal crowns, worn after the coronation, during the banquet held at the Palace of Tau, like the crown of Saint Louis called the Sainte Couronne de France, Henry IV or Louis XIV which were later donated to the treasury of the Abbey of Saint Denis near Paris, the traditional burial place of the Capetian dynasty. 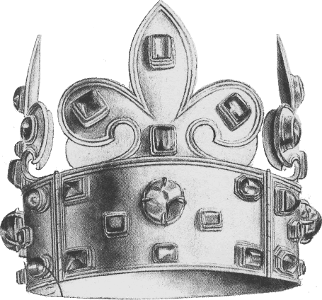 The Imperial Crown of the Holy Roman Empire or Reichskrone, probably made for the coronation of Otto the Great in 962 at the workshops of the imperial monastery of Reichenau, was also later identified as the Crown of Charlemagne and as such appeared on the escutcheon of the Arch-Treasurer of the Holy Roman Empire and at the top of the coat of arms of the Habsburg emperors at the Hofburg Palace in Vienna. When Napoleon proclaimed himself Emperor of France, he also called his own imperial crown the "Crown of Charlemagne".